Warranty - TICINO Watch Co. In the rare event that you experience a defective watch from our facility, TICINO Watch Company extends a one (1) year limited warranty from the date of purchase. Upon realization of a defect, please either contact us or Sizzlin’ Watches (our authorized dealer and order fulfillment partner) immediately to specify the exact nature of your problem. We will attempt to remedy the issue with you via an email or chat exchange. If we can’t resolve your issue through the aforementioned resolution channels, we will offer to either fix the watch for you at no cost (less shipping back to our fulfillment partner’s location) or offer to exchange your defective unit for a brand new watch model. 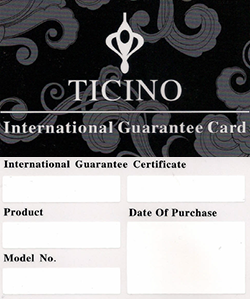 The following image is the front and rear views of the TICINO International Guarantee Card (TIG). This TIG card will be included in the packaging along with your new TICINO Watch Company timepiece. The TIG will list your specific information on the reverse side to help us better serve you should an issue arise with your purchase. Again, contact us if you need any assistance with the functioning of your watch. Thank you for your interest in TICINO Watch Company. Please Note: If you purchase item(s) from our website, your order will be processed and fulfilled by Sizzlin' Watches, one of our authorized dealers. Thank you.